IrpTrace is a tool that watches I/O request packages (IRP) sent to kernel-mode driver(s) of Windows NT 4.0, Windows 2000 or Windows XP. Information about IRP requests can be sent to remote debugger and/or saved to a file. The collected information is available for instantaneous or deferred analysis, which makes this tool indispensable for debugging and support of device drivers. If a driver causes system crash or hangs at processing of an IRP, IrpTrace can help to locate buggy handler by information sent to remote debugger or output window of terminal application. Usually developers insert debug messages to locate crash point. Advantage of IrpTrace in that that: a) it can do it for non-debug version of drivers; b) developer can save time using for writing debug code. If a driver forgets to complete an IRP request, it can cause various problems (up to system hang or blue screen). The list of not completed IRP requests can be determined using IrpTrace. 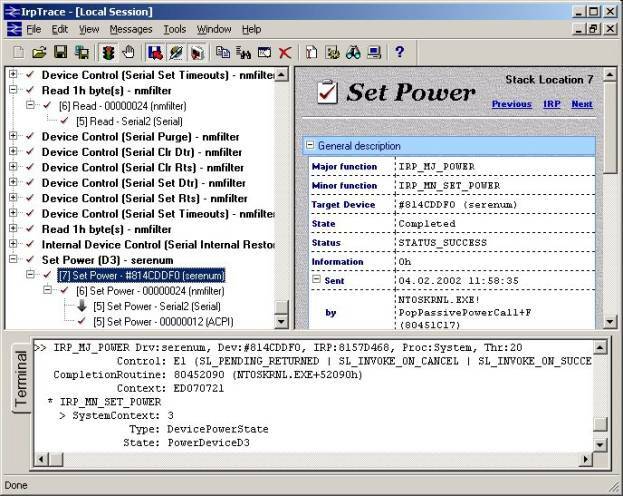 Windows 2000/XP build a stack of physical, filter and functional devices for each PnP device. 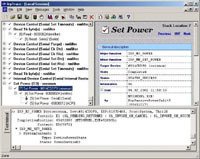 Your software for a PnP device can malfunction due to a third-party software installed on the computer. IrpTrace can help you to locate such kind of problems. In some cases developer need to investigate communication protocol of existing software (driver - application, driver - driver). If protocol is a sequence of I/O requests (for example, device control, internal device control, read and write requests), IrpTrace can help to do it. Click here for additional information. Click here for sample of usage.